Learn more about everyone who participated in the NCBLA event Celebrating Heroines in Fact and Fiction, including authors for young people Katherine Paterson, Rita Williams-Garcia, Jeannine Atkins, and Heather Lang; award-winning illustrator Ekua Holmes; and librarian Grace Worcester Greene. Katherine Paterson is the author of Bridge to Terabithia and Jacob Have I Loved, both winners of the Newbery Medal. She has won the National Book Award twice and has received both the Astrid Lindgren Memorial Award and Hans Christian Andersen Medal. She served as the second United States National Ambassador for Young People’s Literature. Katherine is also a vice president of the board of directors of the NCBLA. Her most recent books are Stories of My Life (Dial); Giving Thanks: Poems, Prayers and Praise Songs of Thanksgiving (Chronicle Books) with illustrations by the renowned scherenschnitte artist Pamela Dalton; and A Stubborn Sweetness and Other Stories for the Christmas Season (Westminster John Knox Press). 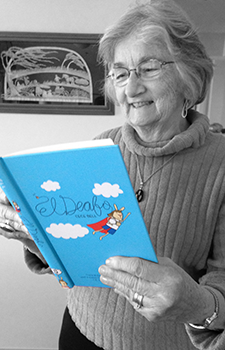 Learn more about Katherine Paterson and her books on her website Terabithia.com and her Facebook page. Rita Williams-Garcia is the author of the Newbery Honor-winning novel, One Crazy Summer, which was a winner of the Coretta Scott King Award, a National Book Award finalist, the recipient of the Scott O’Dell Award for Historical Fiction, and a New York Times bestseller. The sequel, P.S. Be Eleven, was also a Coretta Scott King Award winner and an ALA Notable Children’s Book for Middle Readers. 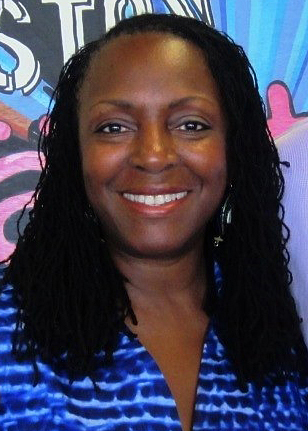 She is also the author of six distinguished novels for young adults: Jumped, a National Book Award finalist; No Laughter Here, Every Time a Rainbow Dies (a Publishers Weekly Best Children’s Book), and Fast Talk on a Slow Track (all ALA Best Books for Young Adults); Blue Tights; and Like Sisters on the Homefront, a Coretta Scott King Honor Book. Rita Williams-Garcia lives in Jamaica, New York, is on the faculty at the Vermont College of Fine Arts in the Writing for Children & Young Adults Program, and has two adult daughters, Stephanie and Michelle, and a son-in-law, Adam. 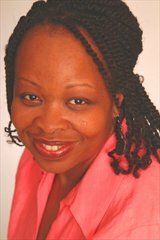 Learn more about Rita Williams-Garcia and her books on her Facebook page. To watch a video interview with Williams-Garcia in which she discusses her favorite book and the need for diverse books, click here. Jeannine Atkins writes mostly about strong girls and women. Her historical verse includes Finding Wonders: Three Girls Who Changed Science (Atheneum); Stone Mirrors: The Sculpture and Silence of Edmonia Lewis (Atheneum); and Borrowed Names: Poems about Laura Ingalls Wilder, Madam C. J. Walker, Marie Curie and Their Daughters (Holt). She lives in western Massachusetts with her husband and dog, who makes sure she gets in the woods each day, and teaches writing in the MFA program at Simmons at the Carle. 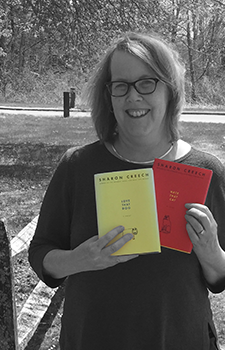 Jeannine Atkins recommends Love that Dog (2001) and Hate that Cat (2008), both by Sharon Creech (HarperCollins), as Great Reads for ages 8-12. Check out more Great Reads here. Learn more about Jeannine Atkins and her books on her website JeannineAtkins.com, and find her on Twitter at Twitter.com/JeannineAtkins. Ekua Holmes is a fine artist whose work explores themes of family, relationships, hope, and faith. Her first picture book Voice of Freedom, Fannie Lou Hamer: Spirit of the Civil Rights Movement (written by Carole Boston Weatherford and published by Candlewick Press), was awarded a Caldecott Honor, a Robert F. Sibert Honor, and the Flora Stieglitz Strauss Award from Bank Street College. Voice of Freedom was also named a Boston Globe-Horn Book Nonfiction Honor Book, and its illustrations received the Society of Illustrators Original Art Silver medal and the Coretta Scott King John Steptoe award for New Talent. Learn more about Ekua Holmes and her work on her website EkuaHolmes.com and Facebook page. Heather Lang loves to research and write about real women who overcame extraordinary obstacles and never gave up on their dreams. Her latest picture book biography, Swimming with Sharks: The Daring Discoveries of Eugenie Clark, joins the “Shark Lady” as she uncovers the secrets of the world’s most feared fish. Heather’s other award-winning picture book biographies include, Fearless Flyer: Ruth Law and Her Flying Machine; The Original Cowgirl: The Wild Adventures of Lucille Mulhall; and Queen of the Track: Alice Coachman, Olympic High-Jump Champion. All four of her books were selected for the ALA Amelia Bloomer List, which honors children’s books with feminist themes. When she is not writing or doing detective work for her next book, she loves to go on adventures with her husband and four children. 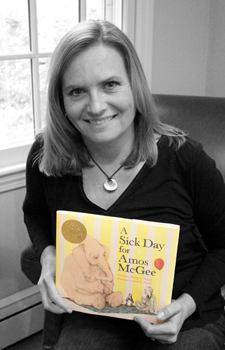 Heather Lang recommends A Sick Day for Amos McGee (Roaring Brook Press, 2010), written by Philip C. Stead and illustrated by Erin E. Stead, as a Great Read for ages 2-7. Check out more Great Reads here. Learn more about Heather and her books on her website HeatherLangBooks.com. If you are on Twitter or Facebook, find Heather at Twitter.com/hblang and Facebook.com/Heather Lang. 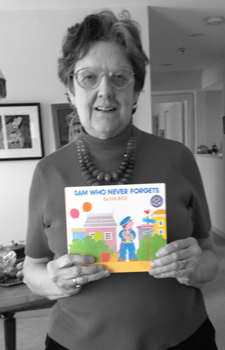 Grace recommends the picture book Sam Who Never Forgets, written and illustrated by Eve Rice (Greenwillow Books, 1977), as a Great Read for ages 2-7. Check out more Great Reads here.